How far do dust particles travel? Note that the information provided here is purely to be used for estimation purposes. If accurate calculations are required, then please look at the original sources. It is often required to estimate how far dust particles will travel once they are liberated into the air by moving cars, wind, or fire. height at which the dust is liberated. Particle size is usually the most important factor because the terminal settling velocity is highly dependent on this particle size. 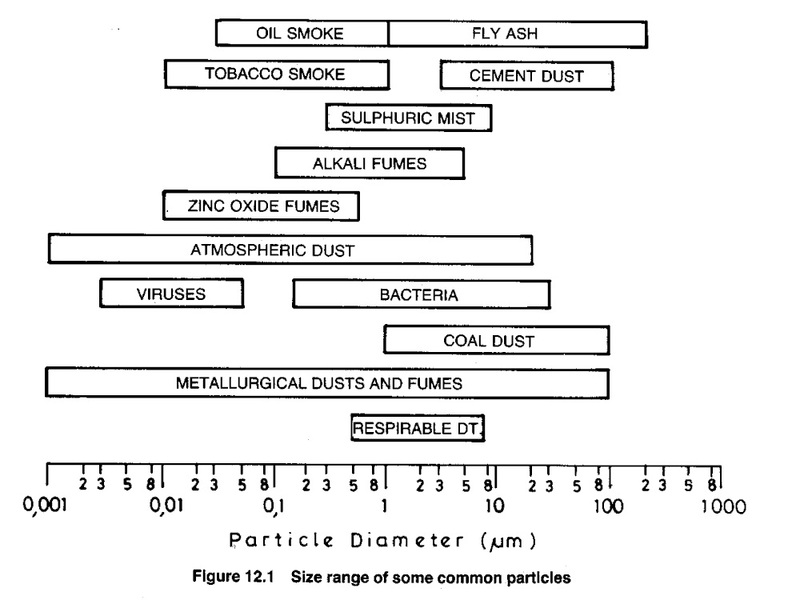 The geometric diameters of air-borne particles may vary between 0.001 µm and 100 µm. The figure below indicates the size range for a few common particles. From the diagram it can be seen that dust particles are seldom larger than 100 µm. This is known as Stokes’ law. It applies to spheres of size below that at which their own velocity creates turbulent flow and (NReynolds greater than 1) or in other words spheres approximately less than 250 µm. Click here to be able to determine your own settling velocities. A unit density quartz sphere of 1 µm would require almost 13 hours to drop from a height of 1.6 metres (theoretically). When particles are very small (less than 1 µm) the actual settling could take much longer because of the bombardment by air molecules, which cause random Brownian motion. In fact particles having terminal settling velocities of the same order as the displacement caused by the Brownian motion will remain permanently suspended, even in still air. Air pressure and moisture content will affect the terminal settling velocity to some extent, basically because of the effect these parameters have on the density of air. For particles with a geometric mean diameter of 0.1 µm the Brownian displacement is about 15 times that of the settling velocity. For particles of 0.01 µm it is almost 900 times. This may also be of consequence in gold mines, as it has been found that nearly 80% of the dust particles in mine air are smaller than 1 µm. These particles may thus penetrate deeply into the alveolar region of a miner’s lung. Admittedly they may deposit in the respiratory tract by impingement or aggregate due to electrostatic charges and cohesion forces to form larger aggregates which will then settle at a finite terminal velocity. Assumption: acceleration time is not included in this estimation. As the particle size increases, so Stokes’ Law is no longer applicable and other formulae need to be used. As an example the settling velocity of a 0.2 cm or 2 mm particle is about 73 m/s. This particle may be blown by the wind, but it will not blow very far unless the winds are constantly above about 100 kph or 62 mph. As an aside, the following table is interesting taken from Perry’s Chemical Engineers’ Handbook, sixth edition, Robert H. Perry and Don Green, pg 5-64. 200 – 500 Unpredictable. Disks and plates tend to wobble, while fuller bluff bodies tend to rotate. 500 – 200000 Rotation about axis of least inertia, frequently coupled with spiral translation. ** Based on diameter of a sphere having the same surface area as the particle. Irregular particles on falling, will not take up a preferred orientation as would particles having an axis o symmetry and they may fall edgewise, for example. The shape and surface of a free falling particle will thus influence its rate of fall in a sense that the particle will always attains a velocity smaller than that of a smooth, regular sphere of equal radius.